When you’re a teenager, anyone over the age of 30 seems to be practically a pensioner and almost impossibly old. You look upon these shuffling oldies and cannot conceive that one day, you will be similarly aged. So imagine how old Yorkshireman Brian Close seemed to me in 1976 when he was called up to play against the legendarily brutal West Indies pace attack. Close, the sort of stocky, fleshy bald bloke that everyone born in Yorkshire has in their family, looked not so much a sacrificial lamb as an old tupp and it seemed like a peculiar act of cruelty to put what appeared to be a pensioner in the way of Michael Holding, Andy Roberts and Wayne Daniels’ bowling. Close had done this before in 1963 against the likes of Wes Hall. He would let the ball hit him, so as not to be caught out, in an act of masochism over technique. Close’s only qualification for this role was, it appeared, that he was prepared to take any amount of blows to the body and head from a cricket ball and still remain standing. In an act of wilful bloody-mindedness that you get with mother’s milk in that county, he would refuse to rub his bruised flesh as another 100mph-er crunched into him, lest it suggest he was in some way weak, or, as we might more traditionally call it, human. Holding ran in like a well-oiled machine, smooth and frictionless and delivered one that reared up and hit Close in the chest, possibly on the heart. Momentarily he staggered forwards and for a second he appeared he was going to pass out, or have some sort of stroke. But no. He just straightened his pads, took a deep breath and carried on. It was almost horrific to watch Close deploy his ‘let it hit you’ policy. Another one came down short, this time on a direct course to break Close’s face open, only to see him pull his head back at the last moment. It all but shaved him on the way through. Time and again this happened. One hit him on the top of the thigh and momentarily seemed to knock the wind out of him, he almost almost rubbed it, but resisted the temptation and with one limp moved away and began prodding the pitch like some sort of cricketing Terminator in pads. I was watching this from Old Trafford on the TV with my grandad Fred from his council house in Castleford. On seeing this full frontal assault, Fred said, ‘tha maght as well ‘ang a pig on an ‘ook in front o’ wickets, it’d be less bloody cruel than seeing an auld lad getting this sort o’ stick.’ Indeed, it was easy to imagine that the porker may have scored more runs too. Close scored 2 in half an hour, though in fairness he had notched a 50 earlier in the series. Close was actually 45 when he opened the third Test and looked if anything 10 years older. Was it too old? Many thought so. It has since been said he no longer had the technique to do the job, but then, much younger men also failed against that pace bowling. Being called up to play Test cricket in his mid-40s was quite a story but Close had been in good nick for Somerset and had a healthy first-class average. It must’ve given hope to all bald middle-aged men everywhere that maybe, just maybe, their career was not yet over. The crinkly cricketer is perhaps less of an unusual sight in the amateur game which often features a portly 50-year-old wicket keeper who keeps a pint behind the stumps. But in the age of proper fitness training, is there any reason why you can’t keep playing first-class cricket into middle-age, especially now there is proper protection and one doesn’t need to see someone being tenderised with a cricket ball like a piece of steak with a mallet? Kent’s Darren Stevens is, I think, the oldest playing in England right now at 42, which is spoken of in hushed tones as though it is remarkable the old boy is still upright. However, he’s got some way to go to beat the record for oldest first class English cricketer which is held by Benjamin Aislabie (1774-1842) for MCC against Cambridge University at Lord’s on 1 and 2 Jul 1841. His age? 67 years and 169 days, sir! The fact he was secretary of the MCC may have influenced his selection, you might well be led to believe. But even he has to bow down to the world record holder for oldest first class cricketer, who was the Governor of Bombay, Raja Maharaj Singh (1878-1959) who took guard aged 72 years and 192 days young. He scored 4 on the opening day of the match played on 25-27 Nov 1950 at Bombay for his XI v. Commonwealth XI. Again, one suspects as it was his XI he insisted, like every child in the schoolyard, that it was his bat and so he insisted on opening with it. 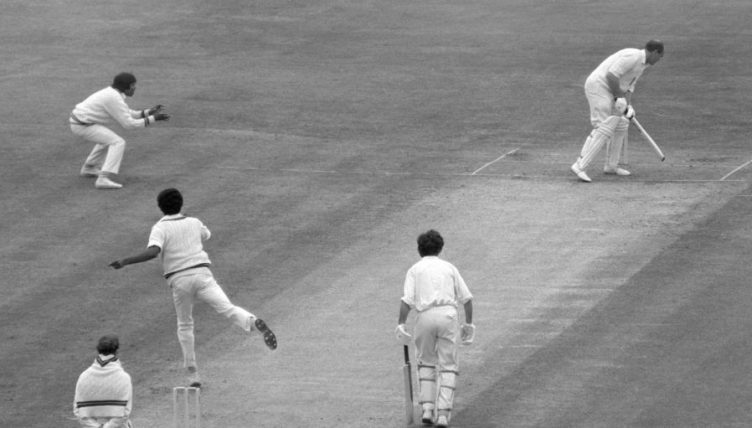 After those three tests in 1976, Close went back to county cricket for a season, retiring in 1977. However, he still played first class games at the Scarborough Festival until the age of 55 and was probably still refusing to show he’d ever been hurt by a cricket ball.